Prop walk is primarily caused by the angle of the shaft, which causes the prop to be tilted. In this attitude, when the prop spins, one blade tip travels farther through the water than the other. To visualize, hold your hands vertical and parallel, like you are about to clap. Now tilt both a few degrees to the right. Note that now the distance from the fingertips of the left hand to the heel of the right is shorter than the distance from the heel of the left to the fingertips of the right. If your hands represent the travel of a tilted two-blade propeller, with the left hand before and the right after one half revolution, you will see that the up-turning blade (left-hand heel) will have traveled farther through the water than the down-turning blade (left-hand fingertips). Consequently, the up-turning blade pushes more water. Which side of the prop this occurs on depends on the direction of rotation. A right-hand prop in reverse will have the up-turning blade on the starboard side, causing more thrust on that side and pushing the stern to port. A left-hand prop has the opposite effect. Unfortunately, there are few practical corrective measures. A decrease in prop diameter or blade pitch can reduce prop walk, but such a change also reduces forward thrust, making this rarely a desirable option. The number of blades is of no consequence. If the keel is flat forward of the prop, some reshaping to improve water flow can make the walk more predictable. 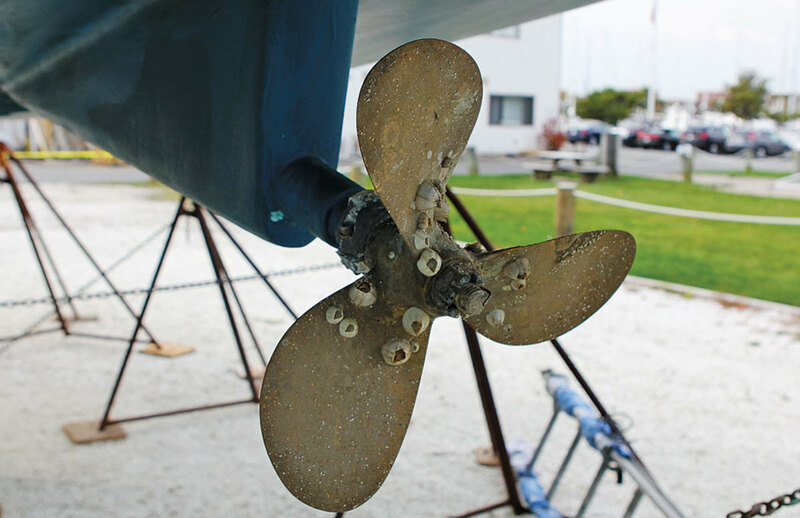 Bow thrusters are now offered for even small boats, but at significant expense, and I think, at some cost to seamanship. Ultimately, the solution to prop walk is the one you mention—learning to compensate. Our problem is not unlike a golfer looking at the contour of the green on a long put. Most of us only back up when forced to, but there is much to be gained by spending an hour in open water backing to a buoy, learning not just how much the boat walks but how far it carries when the engine is in neutral. Intermittent reverse combined with a bit of forward and ample neutral between should be adequate for all but the most trying conditions. On the plus side, there is immense satisfaction in being able to walk the walk.